With the ability to search for just about any answer on the internet, people have turned to DIY projects instead of paying a professional. Many times you can save yourself some money and get the job done. When it comes to your car, however, it may be better to leave these repairs to the experts. Most components of a car are necessary, but you’re definitely not going to be starting your car without the ignition. With the improvements in technology for ignition systems, it’s now harder to fix. Furthermore, you’re dealing with a lot of electricity, which can be very dangerous. If you think that the problem lies within the ignition system, it’s something you want to leave to the experts. You could cause yourself harm or make the problem worse by trying to fix it on your own. Replacing your timing belt is a big-ticket item when fixing your car. Although the $400 to $1000 price tag is frustrating, there’s a reason it’s so expensive. It’s not uncommon for people who try to repair it to damage their entire engine. Although it’s tempting to want to save the money, you risk spending much more to repair your engine. Maybe you can pound or plunge a dent after watching the right YouTube video, but matching paint or doing complex body work is impossible unless you’re a trained professional. If it’s a small job, it’s probably not going to cost much, especially if paint isn’t involved. If it’s a bigger job, you’re not going to be happy with the finished product if you take it on yourself. Body work is something that is almost always best left to the experts. The small pieces that make up the suspension element probably look relatively easy to replace. That misconception is what gets people in trouble. Even though each piece isn’t particularly complicated, the system is very complex. 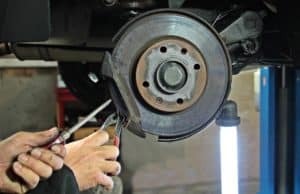 Expensive equipment is needed to replace suspension components, and it’s a very specific procedure that is easy to mess up. Ultimately, it’s not an expensive fix at the mechanic, so it’s not worth the risk of doing it incorrectly. Also, the springs have so much force that trying to replace the components can be dangerous if not done correctly and safely. You’ve probably seen a DIY refrigerant kit at your local auto part store. It’s feasible to do this type of fix on your own, but refrigerant is a hazardous material. Refilling the refrigerant is not smart for most car owners, so anything above that shouldn’t be done at home. It’s often hard to even know what the problem involves when it comes to the AC in your vehicle, and sometimes it means taking apart the dash. It’s tempting to try projects yourself, and that’s especially true if you’re handy. Whether it’s for safety or security, follow this sound advice and don’t try these repairs at home.